Celebrating Christmas in Samui 2018 and looking for things to do? You’re in luck! There are some awesome venues located all over the island which are hosting some really fun Christmas festivities, lunches, dinners and events for people of all ages to enjoy! 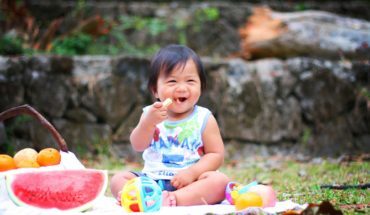 Whether you are looking for an intimate location to spend Christmas Eve dinner with that special person, or a suitable place to enjoy Christmas day with the whole family, make sure you read on to find out the best things to do in Samui for Christmas 2018! Enjoy a night of Christmas festivities in a beautiful tropical outdoor setting at the annual Christmas Eve Dinner Buffet hosted by The Kitchen Table at the prestigious W Hotel Samui. The Kitchen Table’s Christmas menu will feature freshly shucked oysters, poached Tiger Prawns, Alaskan king crab legs, glazed ham, traditional roasted turkey, and an array of classic Christmas desserts. There will be live music throughout the night to enhance the Christmas atmosphere and a visit by Santa Claus to hand out gifts and presents! 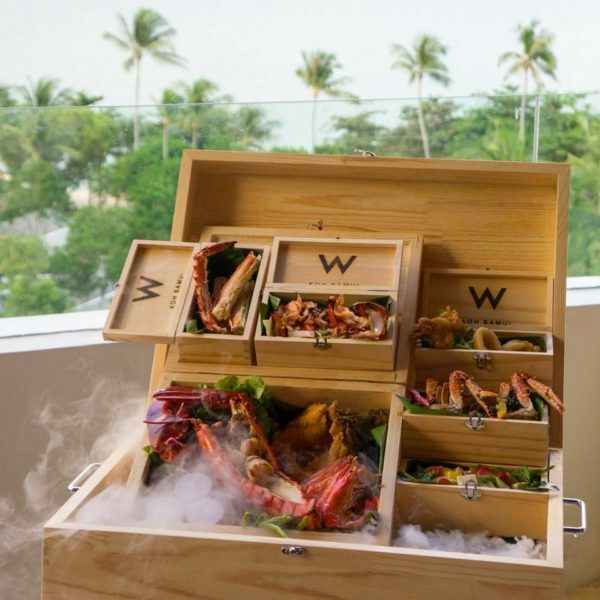 Spend your Christmas day soaking up sunshine and serenity in the private outdoor dining area of the W Hotel — while enjoying some of the freshest seafood Samui has to offer. The Christmas Day menu will consist of a magnificent seafood buffet featuring Alaskan King crab legs, Normandy oysters, Manila clams, smoked salmon and ocean trout. A traditional roasted Christmas Turkey with all of the trimmings will be on offer as well. Guests will also be able to enjoy a free-flow of selected alcoholic beverages, juices and soft drinks with their meals. Christmas festivities will involve plenty of live music throughout the day, lots of fun Christmas decorations and of course a visit from Santa Claus himself! 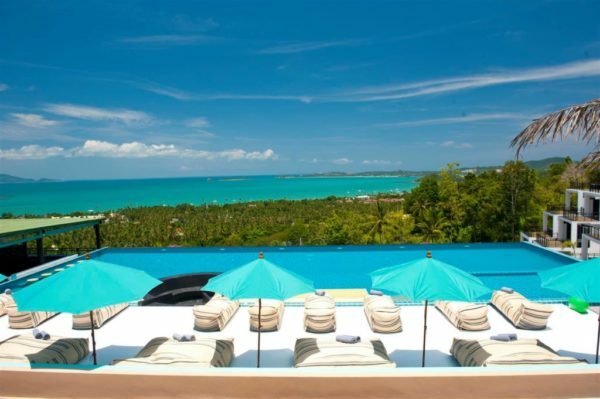 Experience the magic of Christmas in Samui at one of the trendiest beach clubs on the island. 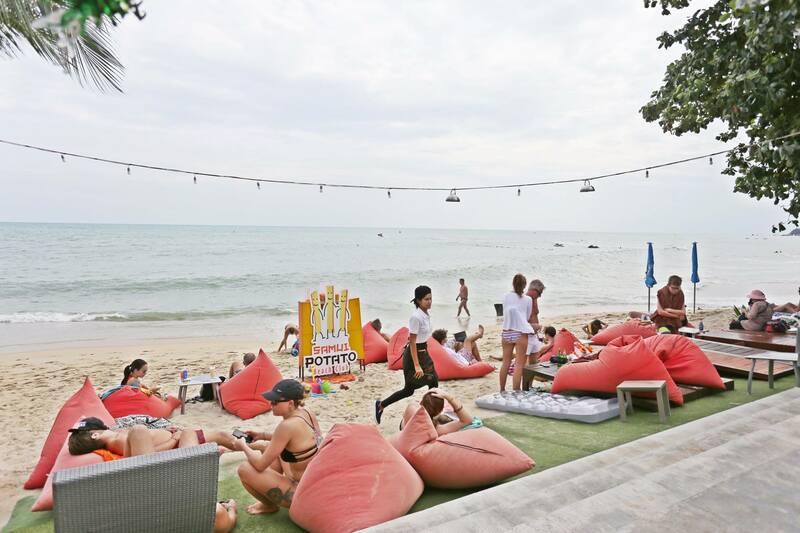 The Potato Beach Club is located right on the shoreline of Lamai Beach, so you will enjoy stunning panoramic views of the ocean while dining on a special Christmas Eve dinner menu. The Christmas Eve dinner will consist of fresh seafood, roast turkey and a huge selection of tasty local Thai dishes. And there will be plenty of alcoholic and non-alcoholic beverages to choose from. You can also expect a visit from Santa at some point throughout the evening to greet guests, pose for photos and give out gifts to those lucky enough to attend. 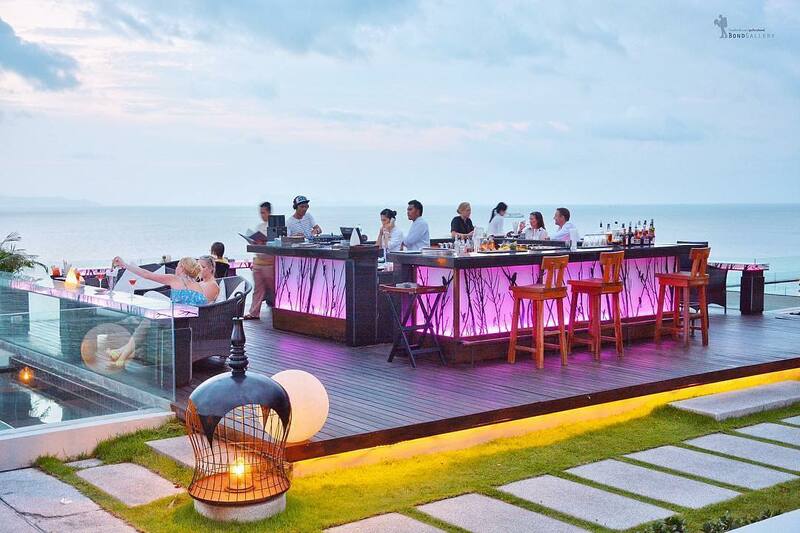 Enjoy Christmas Eve dinner at the opulent Mantra Samui Resort, which has stunning views over the jungle out towards the tropical blue ocean. Spend your Christmas Eve relaxing on one of the many comfy outdoor lounges while dining on a special Christmas menu created by the talented in-house chefs. 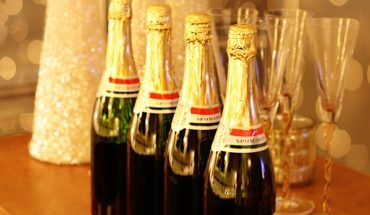 There will be plenty of different food and drink options available including fresh seafood, traditional Christmas roasts and a wide assortment of yummy fruit cocktails to wash it all down. Santa will also be there to give out gifts and celebrate Christmas festivities with diners. Celebrate the festive season in Samui with a memorable Christmas Eve night, consisting of a gourmet buffet dinner and vibrant live entertainment. This family-friendly Christmas event at the Sabai beachfront restaurant (inside the Impiana Resort at Chaweng Beach) will include a fine selection of international cuisine, local dishes and Christmas inspired treats for all to enjoy. There will also be a visit from Santa Claus and live guitar music by Rick Montembeault from the USA to add to the magical Christmas ambience. 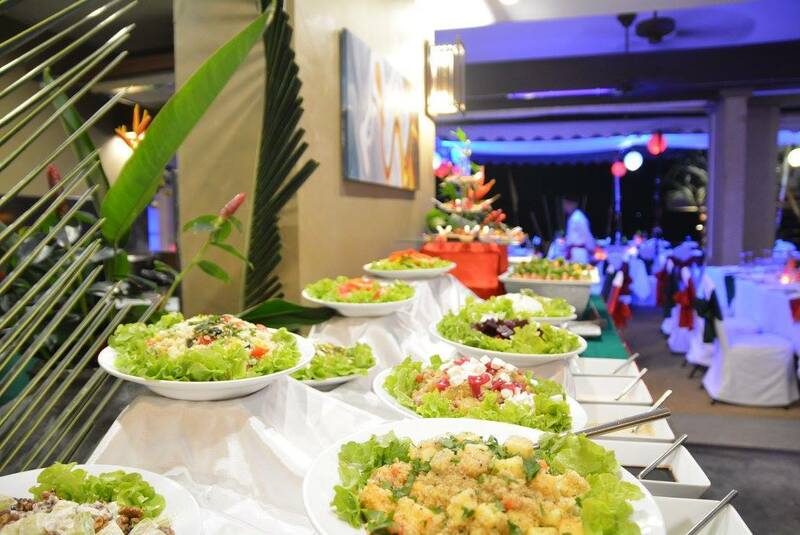 Get together with friends, family and loved ones at the Tongsai Bay restaurant to enjoy an unforgettable Christmas Eve full of delicious food and fun Christmas vibes! Hidden amongst 25 acres of breathtaking natural beauty and overlooking a sandy bay, the Tongsai Bay hotel is renowned for its privacy and tranquillity. Complimentary cocktails and canapés will start the evening and be followed by Christmas carols sung by the friendly Tongsai Staff. A buffet style dinner is on offer with all of your traditional Christmas food favourites, with a live band providing entertainment throughout the night. Children aged 7 and under are free of charge. Experience one of the most sacred traditions of Christmas with the Christmas tree lighting ceremony at the Inter-Continental Samui Baan Taling Ngam Resort. The lighting of the tree will be accompanied by carols by candlelight sing-along – which will definitely fill you with Christmas joy! 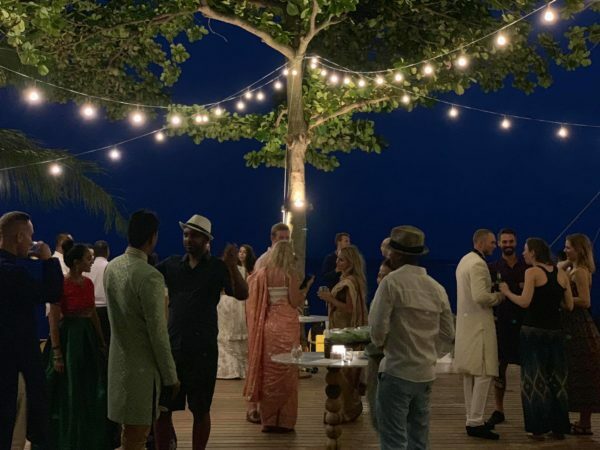 After the lighting ceremony and carols, guests are encouraged to make their way over to the new outdoor bar area to kick-start their Samui Christmas festivities with Tapas finger food and sunset drinks by the ocean. 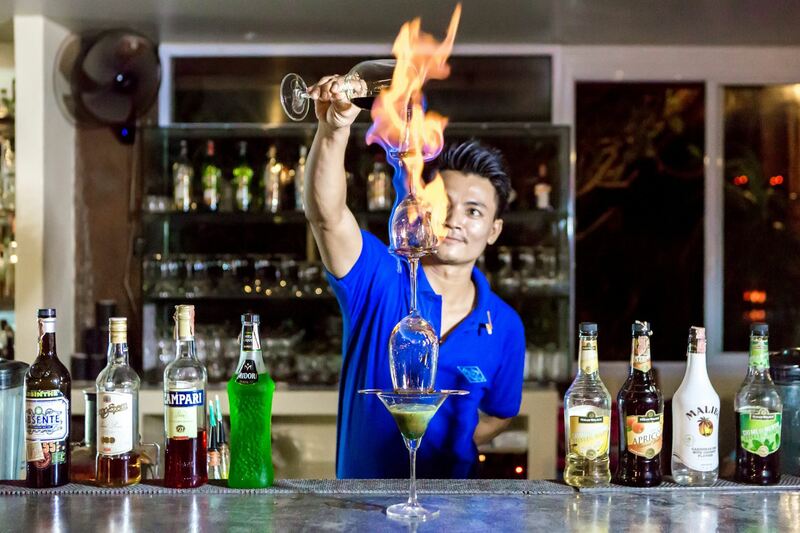 Centara Grand Beach Resort is known for holding extravagant Christmas Eve cocktail parties every year – and 2018 will be no different! The old world charm of colonial-era architecture meets tropical paradise in this truly unique beachfront setting. This long-established and award-winning venue will host a memorable 2018 Christmas Eve event, complete with a delectable Christmas inspired set menu, cocktail party and live music to keep you entertained throughout the evening. The perfect place to spend Christmas Eve with loved ones while enjoying a fine dining experience under starry-lit skies. 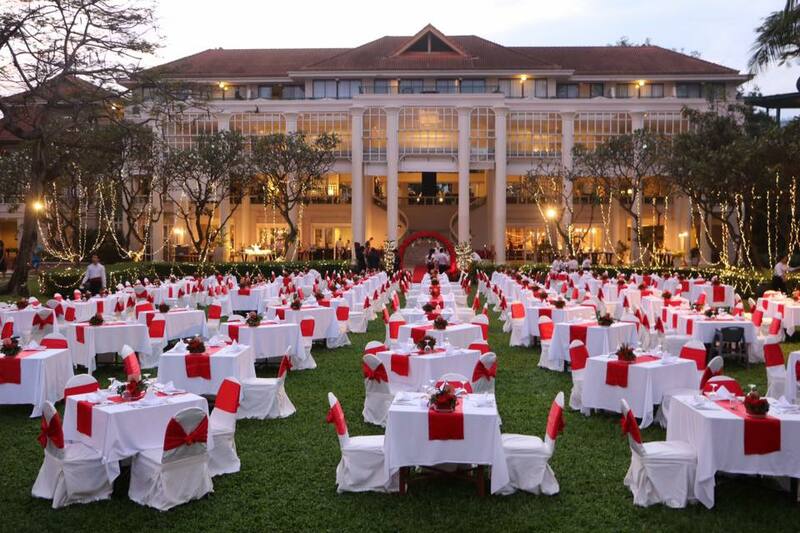 Christmas day brunch at Centara is guaranteed to be a Christmas meal you never forget! You will be able to indulge in a huge selection of traditional roast meat at one of the many Carving stations around the venue. And lots of other delicious meals and drinks will be available from the special Christmas menu created by the skilled in-house chefs. There will also be delightful Christmas tunes being played throughout the day by a live DJ and a talented local Saxophonist will be in attendance to play all of your favourite Christmas tunes. Crystal Bay Beach Club will host another lively Christmas Eve party this year. 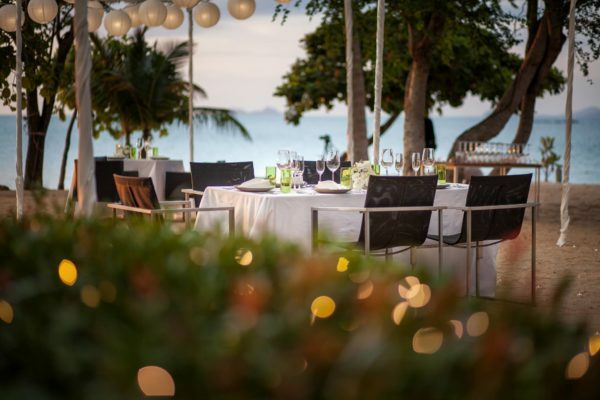 The venue is located in a beautiful tropical island setting, complete with a pristine white sand beach, surrounded by Jungle and huge granite boulders along the shoreline. Cocktails and Canapes will be followed by a delicious 5-course meal of festive Christmas delicacies! Great food, soothing music, a festive ambience and live entertainment are sure to make this a Christmas Eve a night to remember for all who attend. 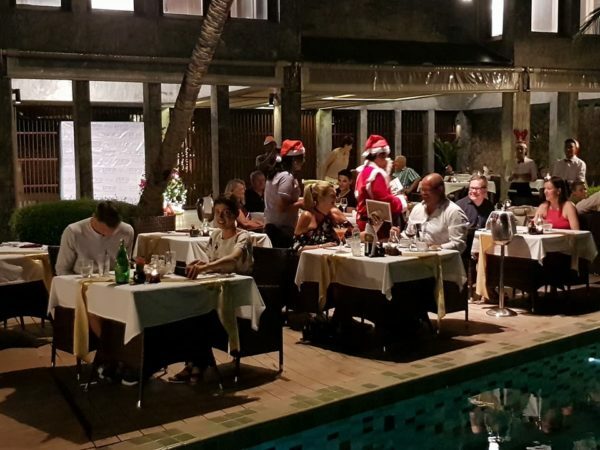 Relax and enjoy Christmas Eve Dinner at the poolside restaurant inside the Prana Resort Hotel and Spa near the Fisherman’s Village in Samui. This exquisite Christmas Eve dining experience will consist of a special Christmas set menu for dinner, singing of Christmas carols throughout the evening and a special guest appearance from the jolly Santa Claus himself! Prana is a smaller venue compared to some of the others on this list so you can expect a more intimate Christmas Eve dinner if you choose to come here. However, you can rest assured the hospitable and friendly staff at Prana will make sure you have a Christmas Eve night you will always remember! 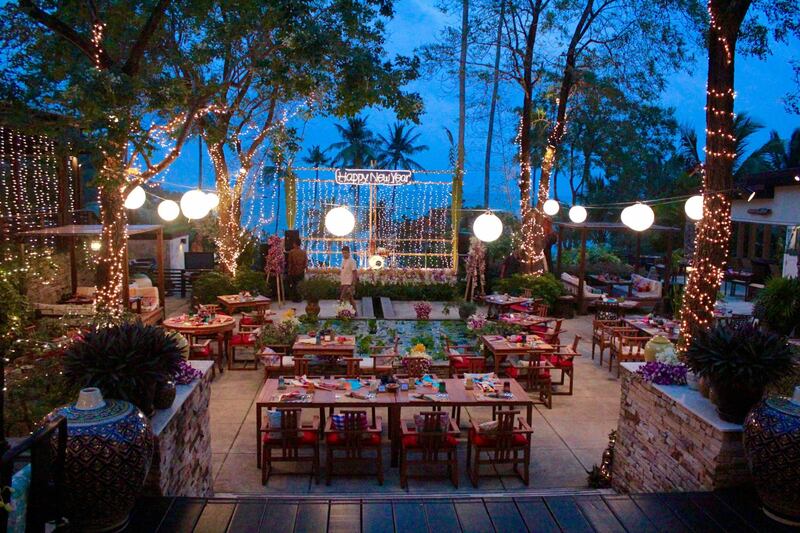 SALA restaurant near Chaweng beach will be the location for a fun festive Christmas Eve night on Samui! A delicious five-course dinner begins with ocean salmon trout, parsnip soup and scallops. Followed by all of your favourite Christmas dishes including roast turkey with stuffing, roasted vegetables, bonbon, chipolata bacon and cranberry jelly for the main course. Finish your delightful Christmas feast with a traditional warm spiced apple confit and Christmas pudding cognac with ice cream. Live acoustic performances will accompany your dinner along with a Christmas carol performance by some of the children from surrounding local villages.